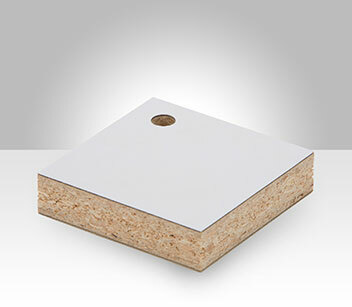 The Advantage Laminating System feeds your substrate and our eco-friendly hot melt adhesive film under infrared heat; your laminate is joined using compression rollers for a finished panel, ready for immediate use! HMT's Advantage hot melt adhesive film is similar to the material used in glue guns but cast in the form of a thin, flexible fabric. It's easy to handle — it can be held in your hand and won't stick to you despite the fact that it is 100% adhesive. "100% adhesive" means there is no liner paper to be peeled off before use. 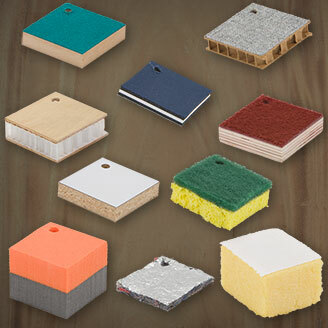 Bond combinations of materials including particleboard, high pressure laminate, wood veneers, linoleum, leather, paper, vinyl, cork, felt, aluminum foil, textured wall covering, carpet, screen, fabric, metal, hook-and-loop, plastic, sponge, foam, aluminum, rubber, insulation, natural products, and much more. HMT's Advantage hot melt adhesive films are quick setting. In fact, curing is 80% complete within seconds. 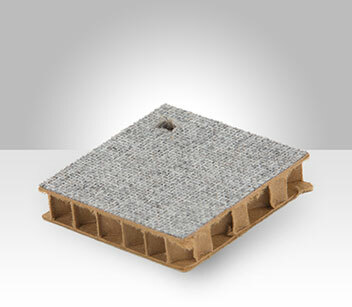 Bonded materials can be used immediately. Instead of waiting hours or days for adhesive to cure, laminated output can be cut, drilled, or otherwise finished right away. When you bond laminates and substrates using traditional glue methods, you expose your organization to slow cure times, uneven adhesive application, toxic fumes, and time-consuming, messy cleanup chores. But you can eliminate these headaches and achieve faster fabrication by using HMT's Advantage Laminating System. Reduced labor cost = higher profit and faster fabrication. But how does a fabricator reduce labor cost without sacrificing quality or laying off friends in the shop? Answer: automation and advanced materials. HMT's Advantage laminator equipment applies consistent hot melt adhesive on a semi-automatic basis. Compared to manual, liquid hot melt glues, HMT adhesives reduce labor costs by up to 50% while offering 10 times more output. 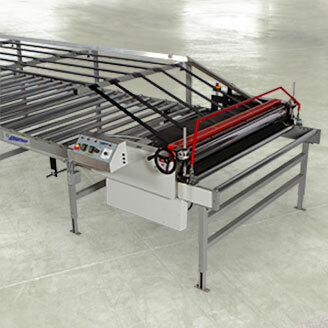 Laminates and substrates are fed into one side of the laminator. Finished laminated material comes out the other side, ready for immediate fabrication. With Advantage hot melt film adhesive, there is no drying time. Because the adhesive is applied and adhered mechanically, there is no risk of uneven adhesive application caused by human error. 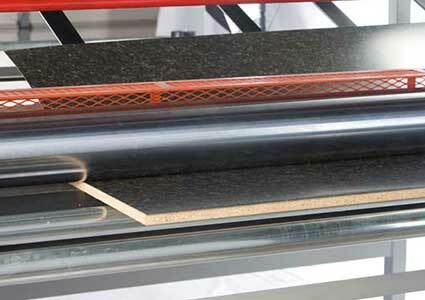 Your labor costs will be reduced because you will produce more laminated output, faster, more consistently. You will eliminate waiting for panels to dry, and you won't spend time replacing panels that failed your quality inspection. By producing more laminated output, faster, and more consistently, you can keep your team busy by accepting more jobs and letting them work on other projects around the shop. Fabrication shops worldwide are increasing productivity using HMT's Advantage Laminating System. By replacing time-consuming practices with affordable automation, production output capacities increase. The consistent output further increases productivity by reducing the time and materials devoted to replacing laminated materials that fail QC inspection. HMT's Advantage hot melt adhesive film applies evenly, consistently, in a thin layer with 100% uniform bond coverage. 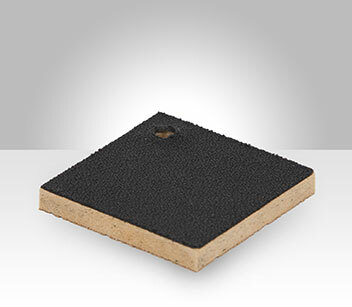 The thin application means less waste, lower adhesive costs, and improved fidelity. Output is very smooth with no pooling, no gapping, no voids. You can't get that consistency with spray adhesives! Our adhesive film is activated by exposing it to a brief, intense infrared heat source in HMT Advantage laminating equipment. The heat melts the adhesive film moments before being applied to your laminate and substrate. 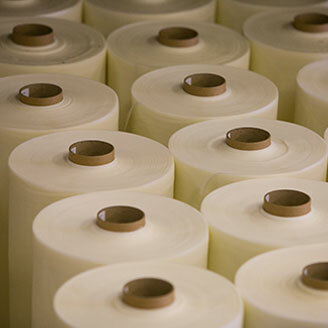 Your materials are never exposed to the infrared heat which means our adhesive can bond delicate materials such as paper, fabric, plastics without distortion. We regularly conduct destructive testing on a variety of laminate surfaces and substrates. In most cases, the bond is stronger than the materials. 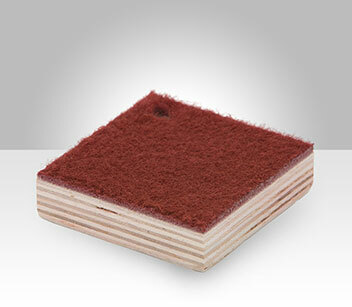 This picture shows the result of a bond strength test in which HPL was bonded to particleboard and then delaminated. 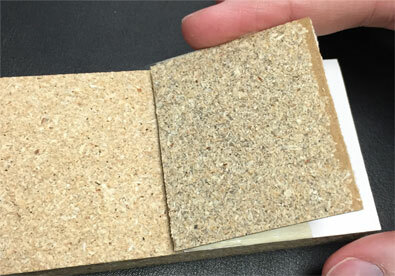 Notice particleboard fibers still adhere to the back of the laminate. The bond remains intact after the substrate material's integrity failed. Delamination tests show our hot melt adhesive film having 125-150 psi plug-pull strength for particleboard bonded to HPL. Bond strength can vary depending on the materials being bonded. Advantage hot melt adhesive film's uniform thickness guarantees consistent area coverage. 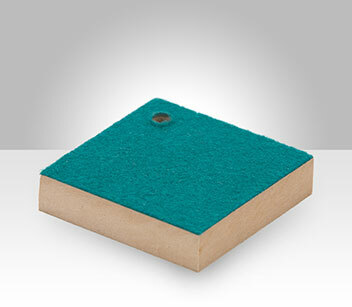 No voids or hollows under your laminate material. No excess spray or spills in your facility. 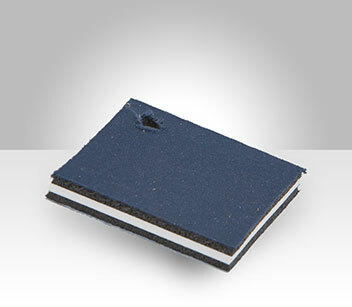 The perfect amount of adhesive is applied throughout the bonded area, evenly, consistently. No waste, no mess, and no quality defects. The consistent output further increases productivity by reducing the time and materials devoted to replacing laminated materials that fail QC inspection. With HMT's Advantage Laminating System, you have the option of feeding flexible rolled material for high volume adhesion to substrates. Our roll stock feed attachment allows roll lamination of flexible materials like fabric, paper, melamine, veneers, screen, leather, foil, wall covering, etc. Advantage hot melt adhesive film is a smart alternative to white glues and liquid hot melt glues that, when cured, become rigid. Our adhesive remains flexible and is ideal for bonding flexible materials such as fabric, carpet, paper, fiberglass, leather, etc. Our adhesive does not migrate through porous materials, either. HMT's Advantage hot melt adhesive film will be the easiest and most efficient adhesive you'll work with. Unlike other glues, hot melt adhesive film does not produce overspray and is not a liquid. There is no waste on your walls, tables, or floors to clean up. Our adhesive eliminates the need to clean hoses, spray guns, manifolds, nozzles, filters, and flushing the entire system. Do you know what's in your adhesive? Solvents, toxins, and VOC's produce invisible air particles that cause reproductive issues, lung damage, neurological damage, headaches, genetic damage causing developmental & cognitive retardation, short-term memory loss, red blood cell damage, nausea, decreases in reaction time, fatigue, and additional medical issues. Why does it matter if an adhesive contains water? Moisture can impact materials. When adhesive cures (dries), the water in an adhesive must evaporate. 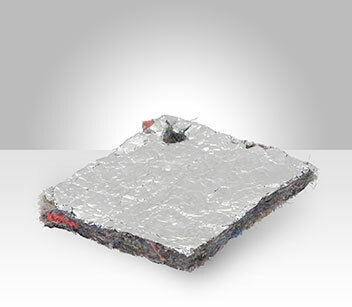 For non-permeable materials such as metal, there is nowhere for the water to go when curing. For permeable materials such as paper, water distorts the material by getting into cells, causing wrinkles and warping. 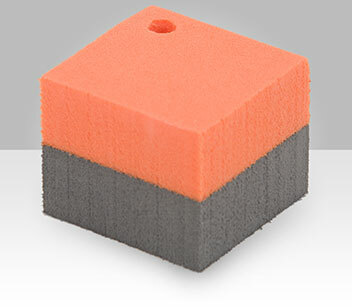 To cure, water-based adhesives require time and space. Simply put, they must sit for an extended period of time until dry. In some cases, dryers are employed to expedite the curing process. Dryers cost money. Running the dryers costs money. Square footage costs money. And, time costs money. All of those costs are eliminated when using Advantage hot melt adhesive film from HMT Manufacturing. 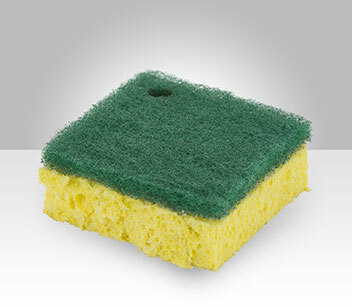 Water-based adhesives require extensive cleanup. Hot melt adhesive film does not. Any water used in the cleanup process of a water-based adhesive is subject to wastewater disposal regulations. When it comes to equipment, a small footprint is crucial because it minimizes the amount of real estate you need to lease, rent, or purchase. 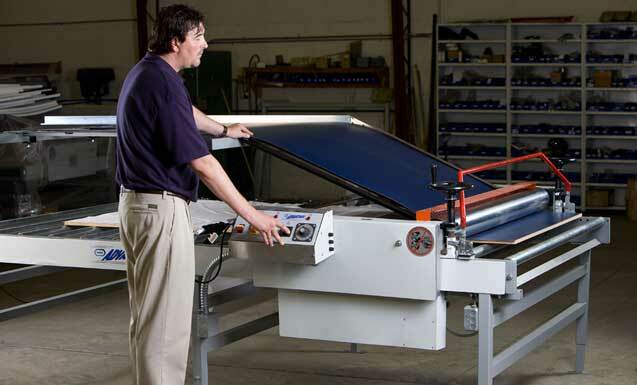 HMT's smallest Advantage laminator is 6'x10′. That means the entire laminating process can occur in 60 square feet (plus an area for panel output, which varies depending on the material you produce). An HMT Advantage laminator uses about 1/3 the space of a spray booth! 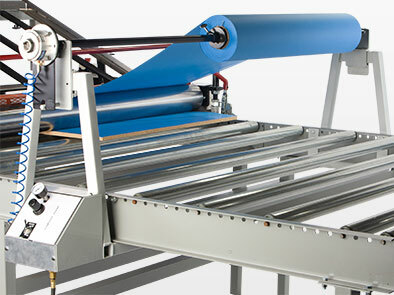 HMT also builds custom laminating machines of various sizes upon request. If you use spray glues in your fabrication shop, you may be wasting 20% of your glue budget. Why? Because 20% of your glue ends up on the floor, the walls, and the table. The next time you see that mess, imagine how many dollar bills are sticking to your floor, walls, and table. To make matters worse, imagine the labor cost of cleaning that mess up. There is a solution. 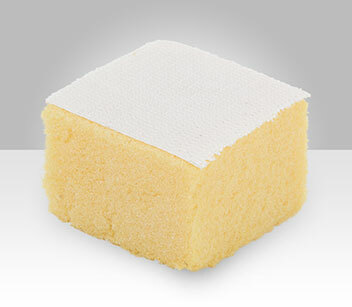 Hot melt adhesive film is clean and promotes a waste-free workflow. By applying only the adhesive you need, you will reduce waste to practically zero. And, you will also enjoy the added benefit of eliminating clean up. During the cleanup of spray glues, you use a significant amount of water and may incur wastewater disposal fees. That adds even more to your cost of ownership for a spray adhesive system. HMT Advantage lamination equipment is easy to install. Allow a few hours to assemble your new laminator using common tools. With every new laminator, we include a DVD that provides complete assembly instructions and video demonstrations of every assembly step. The DVD includes both English and Spanish versions. For technical support, call 1-800-433-0730. Our adhesives have always been free of volatile organic compounds (VOC's) and solvents. 100% of our hot melt products are produced using solar and wind power. 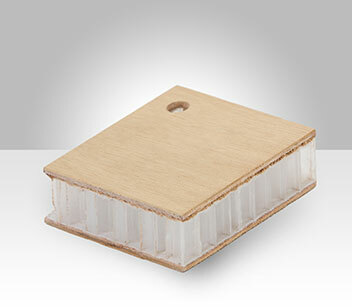 Our adhesives use minimal cardboard packaging and that packaging is recyclable. Because our adhesive film is linerless, there are no backing papers or liners to dispose of. And, unlike messy glues, our adhesives don't require extensive cleaning. That virtually eliminates the need for disposal of toxic wastewater. 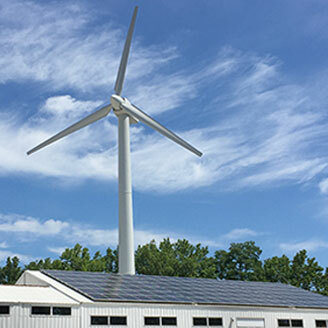 When you use HMT adhesives in your product, you are using solvent-free, toxin-free, VOC-free material made with renewable energy. Better for our planet, better for your customers, better for your employees, and better for future generations. HMT Advantage.